George Herms must get tired of being referred to as the last of his generation. Born in 1935, he was amongst the youngest of the Beats and a pioneer of the California Assemblage movement. Like many of his peers he saw his lack of art school training as no impediment to combining found objects in the way that he might compose a poem, or jam with jazz musicians. By reputation, and by the evidence of his unkempt but literary art, he’s a free spirit, a mystic. He stands (especially in younger minds) for a now rare artistic archetype, pure of heart and innocent of commercial ambition. Herms is regarded with affection, and, as ‘George Herms: Xenophilia (Love of the Unknown)’ proposes, his work remains a touchstone for a slew of artists working today. The exhibition, curated by Neville Wakefield, gathers a few distinct constituencies of artists: Herms brings along his ‘long-time friend and colleague’ Robert Branaman to show alongside Angeleno artists both established (such as Sterling Ruby) and emerging (Melodie Mousset and Kaari Upson), as well as the group of New York artists that includes Dan Colen, Hanna Liden, Nate Lowman and Ryan McGinley. They share, the show’s introductory text suggests, a debt not just to Herms’s improvisational way with found objects but also to his ‘spiritual legacy’. I admit to being suspicious of these exercises in historical alignment. At their worst, the veteran is positioned as influential and relevant, and the younger artists are shown to be working within a continuum that validates their profiles and market positions. Historical comparison has always seemed to me to be an overrated way of understanding the present, mainly because it underestimates how different the past was. That said, Herms’s work jibes in all sorts of unforeseen ways with that of the other artists in this show. It is interesting to approach the creepily forensic work of Upson, whose large pink latex sculpture (Untitled, 2011) dominates the first gallery, via the history of assemblage. Upson’s art has the seedy, decaying tone that Herms’s must once have had, but (by and large) now lacks; constructions by Herms such as Me and Mrs Jones (2011), a quaint box of old wooden letters and numbers, show that yesterday’s trash can easily look like today’s vintage curio. Less nostalgic is Herms’s series of collages, ‘Xenophilia’ (2011): colourful ejaculations of modern luxury goods – diamonds, perfume bottles, cars, flowers and silks – snipped from magazines. Nearby, a pen drawing by Branaman titled Timothy’s Birthday (1966) features mandalas densely populated by buxom naked women. Ari Marcopoulos contributes ten photocopied pages from Wallace Berman’s magazine Semina (1955–64) with pudenda drawn in shaky lines across them. Boyishness here risks turning into boorishness, and is coldly rebuffed by Mousset’s ceramic sculpture Downward Dog (2011). Realizing that the title refers to a yoga position, I shuddered to imagine that the piece – a blanket draped over a hidden form – might have been cast from an improbably contorted female body. Upstairs, the high-ceilinged gallery at first seems overly packed, then not packed enough. Herms is, after all, a compulsive hoarder. It’s impressive to see that he is as productive as ever: alongside works from the 1980s and ’90s, waves of crumpled letters gush from boxes in Winow, while the melted plastic forms of Recumbent Cycle (both works 2011) hang in a silver halo overhead. Herms’s old correspondence – or rather envelopes addressed to him – also features in Kathryn Andrews’s two installations, Letter and Letter to George Herms (both 2011). These works contrast the yellowing stationery with – respectively – a chrome waiting-room bench and a fake pot plant, both rented from prop houses. Unlike most of the refuse and relics recycled by Herms (and others), these items’ redesignation as art is just another day’s work. 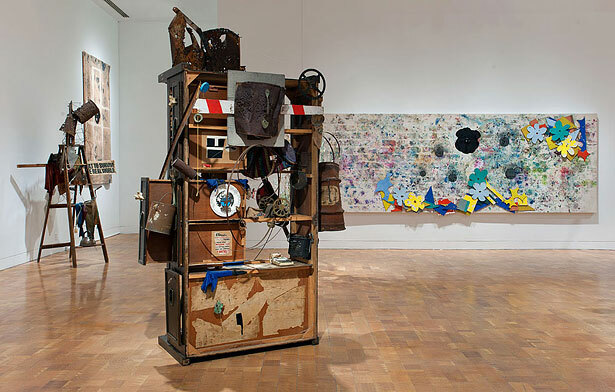 The life and death of objects – and, by extension, of ideas and ideologies – begins to gather steam as the show’s dominant theme. What else, though, do these art works really share with one another? Ruby’s ceramic Basin Theology / Kiln Ripper (2011), a dish containing lumpen shards from previous, presumably failed works, expresses all of Herms’s urgent handling of material. Elliott Hundley’s exquisite hanging web of sticks, sequins, pins and coral, on the other hand, has none of the former’s gruff machismo. Collaboration, though attractive in principle, rarely leads to singular art works if the collaborators aren’t able to find a shared vision. Colen, Lowman, Agathe Snow, Leo Fitzpatrick and Lidén clubbed together to produce Untitled (2011) – a widescreen unprimed canvas of spattered paint and stylistic tropes (Lowman’s trademark bullet holes were recognizable, as were peg-board flower shapes previously used by Snow). It resembles a studio floor or a graffitied wall – too many voices trying to shout at once, but not trying for a moment to justify its nearly ten square metres of wallspace. It was all swagger and no direction. And just what do McGinley’s photographs of his naked friends have to do with Herms? Perhaps this is his ‘spiritual legacy’, a kind of prelapsarian hippiedom. One starts to suspect that Herms’s counter-culture credentials are being used to bolster artists whose market relies on their cachet as much as their work. The exhibition’s wall text revealingly states that, ‘In 2008, Herms was invited to Florence by designer Adam Kimmel who was being celebrated by the Italian fashion event organizer Pitti Immagine.’ (Really? The name-dropping here is extraordinary.) It was there, paraded as the real-life inspiration for Kimmel’s clothes, that he met Wakefield and the New York artists included in the show. Strange as it is to imagine Herms at a fashion party, one can imagine the older artist being impressed by the particular joie de vivre unique to artists so young and successful that they are flown to Italy for parties. The question of who – if anyone – is being taken advantage of here, and which bandwagons are being jumped on, must ultimately remain unanswered. Maybe in Herms’s world there’s no room for cynicism. That’s not a bad world to live in.